Throughout 2013, in honor of the 50th anniversary of Dr. King's I Have a Dream speech, Building Understanding is proud to partner with the King Center, Points of Light, the Global Peace Foundation, the Georgia Commission on Service and Volunteerism, Georgia State University, Youth Universe, and others for the Be the Dream Service projects in a year-long commitment to beautify and revitalize the Martin Luther King Jr. Center for Nonviolent Social Change. 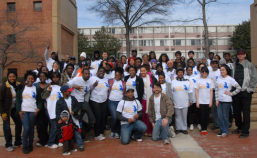 Click for photos from kickoff project day on Jan 15 and the Jan 26 project day. Volunteer and make a difference while making friends. Stay tuned for upcoming dates. © 2011 Building Understanding (BUDS), All Rights Reserved.